The Summer 2015 Infinity Cup Final was the final match of the inaugural Infinity Cup. It occurred on July 5th, 2015. The match saw the two top scoring teams of the tournament, /a/ and /christian/ pitted against each other. Despite dominant performances by both teams, /a/'s front line of DIO BRANDO-Kaiser Reinhardo-Nano was simply too much for /christian/ to handle, and /a/ won the match 8–5, becoming the first Infinity Cup champion. 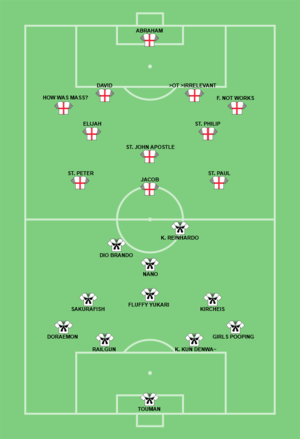 /a/ kicked off the 2015 Summer Cup Final, and quickly went on the attack, with early forays into /christian/'s zone in the first and second minutes. /christian/ repelled the early attacks, and countered with a quick advance into /a/'s zone during the 3rd minute, but St. Paul was stripped and the ball was cleared by Kircheis to Kaiser Reinhardo. Reinhardo managed to slot a long pass beyond Elijah and David to the streaking DIO BRANDO, who took a hard shot from beyond the box late in the 4th minute that Abraham was forced to save. DIO took the resulting corner, which Fluffy Yukari headed on goal. Abraham punched the ball to the edge of the box, but Nano recovered it for /a/ and took a hard shot that Abraham blocked, but could not hold. The rebound fell to DIO BRANDO, who was at the side of the goal, and he easily slotted one into the now empty net to give /a/ a 1 - 0 lead in the 5th minute. /christian/ was slow to respond to /a/'s quick goal. Off of the kickoff, they began a string of backpasses which eventually came to Elijah. Elijah booted the ball toward How Was Mass?, but Sakurafish intercepted it and /a/ went on the offensive again. A Kaiser Reinhardo chip over the /christian/ back line fell to a sliding DIO BRANDO, who only missed the net due to the intervention of /christian/ keeper Abraham, who deflected the ball out of play. Kircheis took the corner, which appeared to be a wash as it fell to the far edge of the box. Two /a/ players, Fluffy Yukari and Girls Pooping, got tangled up as the ball fell to them, but GP managed to recover it before a charging >OT >IRRELEVANT could, and GP slotted one past Abraham in the 7th minute to make it 2 - 0 /a/. In spite of what had previously happened, /christian/ once again reverted to backpassing, and in predictable fashion it quickly backfired. Kircheis intercepted a bad pass, and /a/ went on the offensive for the fifth time within the first ten minutes of the match. This time, however, /a/ did not manage to get a ball into the box, and the ball went out for a goal kick just after the ten minute mark. Abraham finally gifted /christian/ some momentum to attack with a booming punt that dropped the ball well over the half line, but another bad pass in the /a/ zone by St. Philip deflected off of Fluffy Yukari and sent /a/ driving into the /christian/ zone once more. Although again nothing came of /a/'s attack, only an offside allowed /christian/ to clear the zone. A booming punt off the free kick gave /christian/ a good chance, and it was then that they finally capitalized. St. Paul chipped a pass up and behind the /a/ line, straight to Jacob, who put one past TOUMan without even trying in the 14th minute, making it 2 - 1. Despite attempts to continue their dominant attack, for several minutes after /christian/'s first goal, /a/ could not move the ball. In the 17th minute, a long ball by St. Paul fell to St. Peter in the box, but the kick was saved by TOUMan. Off the punt, Nano managed to get a memeball on goal with DIO BRANDO trailing, but the ball outpaced DIO, and Abraham saved the ball as DIO made a dolphin dive. /christian/ came back at /a/ with a second quick attack, but a St. Paul pass only just outpaced St. Peter, and TOUMan made a sliding save. Nonetheless, /christian/ kept up the attack, and finally broke /a/'s line in the 22nd minute. St. Peter chipped a pass to Jacob in the 22nd, who slotted it beyond the /a/ back line to St. Paul. TOUMan dived, but did so a split-second too late, and St. Paul bombed one into the back of the net to tie the game at 2 - 2. Off the kickoff, /christian/ continued to pressure /a/. In the 26th, /christian/ managed to get into /a/'s box, but nothing came of the attack, and /a/ cleared the zone. However, /a/'s troubles with the ball continued, and in the 31st minute, /christian/ went on the attack again. Jacob got the ball behind the /a/ defensive line, and St. Peter drove a hard ball into the back of the net before TOUMan had even begun to dive, turning what had been a 2 - 0 game for /a/ into a 3 - 2 /christian/ lead. /christian/'s lead would not last long, however. In the 33rd minute, /a/ managed to shut down a /christian/ attack, and TOUMan punted the ball far down the field. The ball fell to DIO BRANDO, and a well placed header fell to the streaking Nano, who took a shot from outside the box. Abraham saved the ball, but it went out for a corner. DIO took the corner, which fell into a mass of bodies and was headed out by St. Peter. The ball came to Sakurafish, who played the ball to Fluffy Yukari. Somehow, Doraemon broke away from the mass, taking a clear shot from the edge of the six-yard box as the ball came to him. The ball rocketed past a diving Abraham, but hit the post and ricocheted toward the side of the empty goal. David tried to get to the ball, but Kaiser Reinhardo got his foot to the ball first, and chipped it into the open goal, leveling the game at 3 - 3. This page was last edited on 19 April 2016, at 21:37.